The City is excited to welcome pianist Althea Waites and the Angel City Chorale, who are performing! Internationally acclaimed American pianist Althea Waites will perform Duke Ellington's The Single Petal of a Rose. Ms. Waites has performed extensively throughout the United States, Europe and Asia as a brilliant soloist, chamber musician, and collaborative artist. The Angel City Chorale will present Woody Guthrie's This Land is Your Land. The ACC features an eclectic repertoire at exuberant, standing-room-only concerts, with musical genres including classical, gospel, jazz, pop and world music. ACC was recently featured on America's Got Talent. 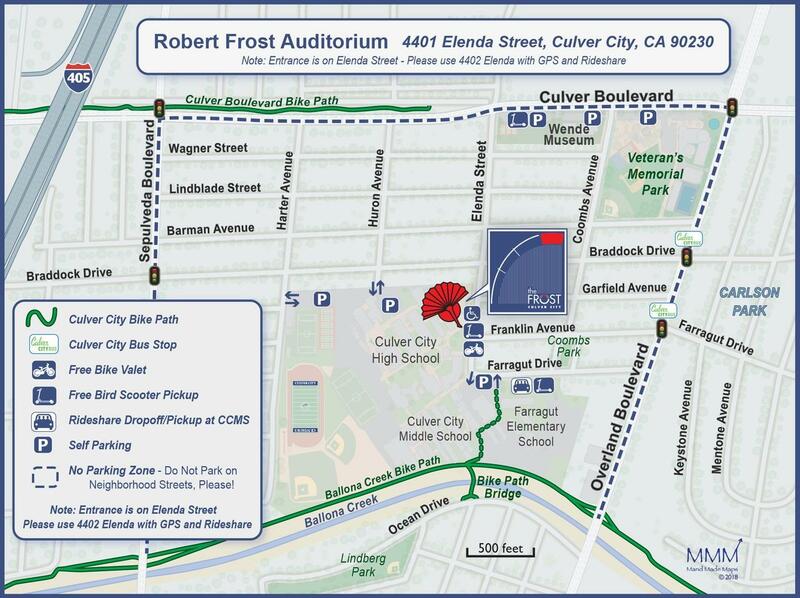 The State of the City Address will be held at the Robert Frost Auditorium, located at 4401 Elenda Street, Culver City. Networking and mingling will begin at 4:30 p.m., with the program promptly starting at 5:30 p.m. The event is free and open to the public. Childcare will be provided for children who are toilet-trained. Please contact the City Manager's Office at 310-253-6000 or email the City Manager's Office, if you have any questions. If you need to drive to the event, please park only in the designated FREE parking lots that surround the facility. Corner of Elenda Street and Farragut Drive - South of the Robert Frost Auditorium. Between the Culver City Middle School and Farragut Elementary School. Huron Avenue - From Elenda Street, head west on Braddock Drive. Entrance is on the south side of Braddock. Harter Avenue - From Elenda, head west on Braddock Drive. Pass Huron Avenue and go south on Harter Avenue. Parking is on your left. Overflow parking is located at Culver Boulevard and Elenda Street. Please respect the residents and do not park in the neighborhood.